I remember the first time an argument with my husband came to blows. I don’t remember exactly what the argument was about or even the words that were spoken, but I remember what I was thinking and feeling as the event transpired. The reasons for the fights eventually all seemed to just blend together. He would become angry and irate over something trivial or minute, but it was always something that required he relinquish some form of control, or rather my disagreement with surrendering even further into his control. I remember arguing over the amount of time we spent talking and texting on the phone. I remember arguing over the amount of time I would spend at my own home before taking a bus to his place to spend time with him. I remember arguing about having to leave to catch the last bus home before the route stopped running. I remember arguing over how far we would take our make-out sessions. I remember arguing about wanting to spend a day with my friends without him. And I was so blind to what was going on. I had no idea he was coercing me, manipulating me, playing off my desire for a relationship, my desire to feel the love and affection of a boyfriend, and making me feel guilty for wanting enough space to be ME. We argued so often, it had become expected. I didn’t know any different. And I always felt, somehow, that the arguments were my fault, because my desires for living a portion of my life apart from him were somehow selfish. Every time he’d become angry, I remember thinking I had to prove myself to him, and I had to show him through my calm resolve as he would rage, and yell, and pace, and spit, and curse that there was a better way to resolve disagreements. Before the first blow landed, I’d come to learn about his past, and of course that only made the attachment worse. Because his past was one of turmoil and suffering, and I’d developed a kind of savior complex. I thought that remaining calm and collected as he raged would show him how much I loved him and help him heal from his emotional injuries of childhood. So it was that each fight seemed to get worse and worse, because rather than helping heal him, my actions were showing him how far he could go without losing me. Each fight resulted in him gaining a little more control over me. Each fight settled another hook, another rope, another coil around my heart. The more control he sought, the more I resisted, but eventually caved as his tantrum-like behavior only intensified. And then it happened. I remember him pacing. I remember thinking he was acting very immaturely and that we’d make much more progress with resolving our disagreement if he’d just calm down. I think I even rolled my eyes. I remember the cursing and yelling, and I remember him stepping right up in front of me so that our toes practically touched and I had to arch my neck to keep eye contact as he spat his venomous words with spittle hitting my face. I said something in response, I don’t remember what, but I think it held a slight tone of sarcasm as I felt his temper had grown old. And the next thing I knew, there was a heavy weight on my shoulders, a sharp pain in the back of my head, a sense of momentary weightlessness, and for a very brief second everything went black. Everything seemed to come together so slowly as my brain caught up with the rest of my body, and I realized he’d grabbed me by the shoulders and thrown me against the wall. I was shocked and confused, and so I didn’t know what to think when he froze in shock as well and then started apologizing profusely. Just as his anger was always over the top, his horror and despair seemed far too dramatic for what had just transpired. He seemed on the verge of suicidal thoughts for the immense guilt that washed over him for having caused me bodily harm. This advice is not all that dissimilar from what I attempted throughout the entirety of my relationship with my now ex-husband. Each calm and collected refusal simply resulted in a more and more violent outburst, until I was eventually hurt. What’s more, I continued attempting to follow this pattern well after the first blow landed. Each and every fight from that point on resulted in some physical harm in some form or another, and the fights only continued to escalate. The entire relationship, from our first date to the day I walked out that door to never again look back, lasted just under two years. In two years, this man went from a head-over-heels, love-struck gentleman to a half-crazed animal who threatened to cut me open with a butchers knife because he’d stepped on my razor in the shower. I had absolutely no idea going into this relationship that this man would turn out to be an abuser. I had absolutely no idea that, even in the very beginning of our relationship, he was manipulating me into position for him to have full control, but had I been privy to a better education on domestic violence I would have seen numerous red-flags early on in his behavior and attitudes. So why was I so poorly prepared? People, in general, seem to know very little about domestic violence. In fact, worse than knowing little, they think they know plenty, and what they think they know is typically false. For example, before experiencing abuse myself, I was convinced that abusers would be obvious and easy to spot. I assumed they would be harsh, cruel, and physically violent from day one. I pictured abusers as muscular bullies who picked on others and tried to strong-arm their way into relationships with shallow and beautiful girls. Note here – I’m also making an assumption about the kind of women who end up with abusers. I believed, before experiencing it for myself, that all women who entered abusive relationships were shallow and physically beautiful. With statements like this coming from a supposed expert of family violence, it’s no wonder people fail to understand. 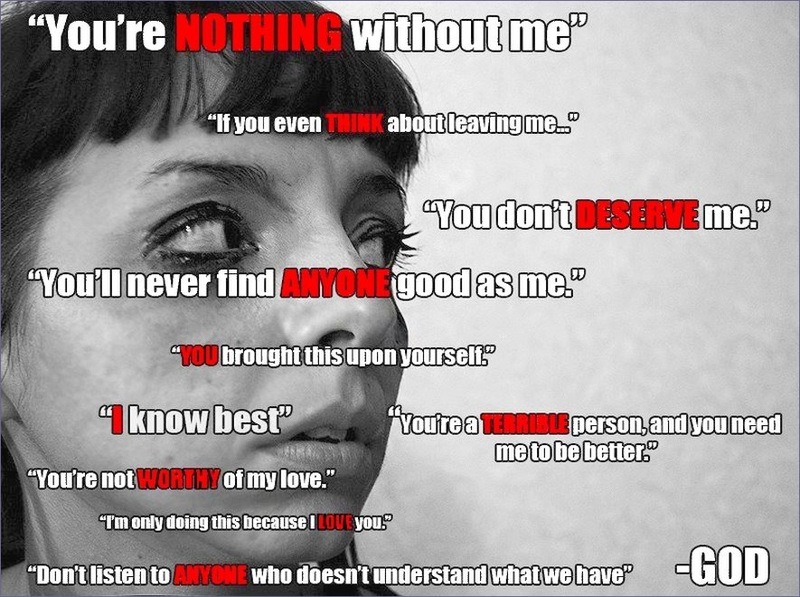 Abusive relationships follow a characteristic pattern, and this pattern is repeated time and time again in countless relationships not because there are women who goad their husbands into fights so they can sport a black eye, but because there are far too many men who seek to gain and maintain control over their spouse by any means necessary. Such efforts to control and dominate are fostered in religious cultures which strive to subjugate women. While we certainly won’t hear such passages preached from the pulpit, you can rest assured that this line of thinking is still strong in Christianity. Else, why would men like James Dobson suggest that women should pick fights with their husbands to somehow teach them a lesson about their ridiculous rage and state that divorce is not an option for a Christian marriage? The certificate of marriage, what we now like to think of as a wonderful declaration of love between two people, is based on what was historically nothing more than a writ of sale. While we may be making many leaps and bounds in pushing past racism, sexism, etc, religious institutions are holding us back and are at least somewhat responsible for promoting teachings which lead to abusive marriages. I was taught as a youth that the greatest and most noble goal I could achieve was to become a wife and mother. I was encouraged to pursue an education if I so chose, but not a career, because my education was meant to be used to assist in the teaching of my children. I was meant to find a good, faithful man to marry who could provide for me while I bore him children. I could pursue other interests, of course, but to take up a career while there were children to raise would be greatly frowned upon unless circumstances prevented my husband from providing enough for the family on his own. These teachings all stemmed from religious views on marriage and family. It was based on the belief that man and women were meant to cleave unto one another in a contract with God to raise up a righteous family in the church, promising to teach the next generation to worship Him. I was taught that this design was divine, and to go against it was sinful. This entire “design”, however, has women taking on a role of servitude rather than equality, and because of this, men are put in a position of power and authority. Not all men abuse such power, but those that do abuse their families. Extremely well written! Thank you!